Ben & Jen Enjoy A Family Day Out With Their Girls! Home » Ben & Jen Enjoy A Family Day Out With Their Girls! Busy Sunday! 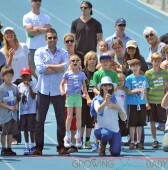 Ben Affleck and Jennifer Garner were on the go in Los Angeles yesterday. The family started their day off at the market to pick up snacks before heading to the Palisades High School to watch their girls run. Ready to race, Violet wore a mauve shirt and green shorts, while Seraphina opted for a navy striped jumper. When it was go time, Ben and Jen waited at the finish line with Violet while Seraphina ran. Jen video taped her sprint while Violet cheered her on!